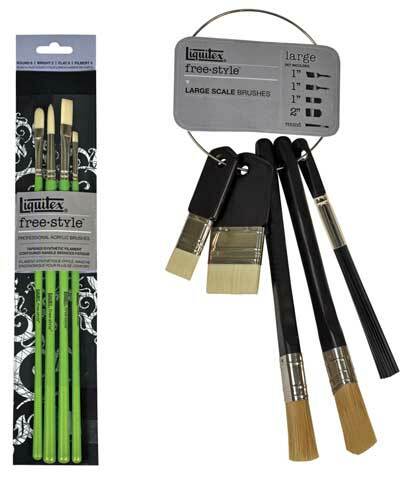 These sets feature brushes that have blended synthetic bristles with ideal snap and spring for acrylics. The bristles are secured to the handles with rustproof stainless steel ferrules. The traditional brushes have long, contoured bright green handles with a satin matte finish that provides extra comfort when holding the brush. They work well for fine detail work. Ideal for large paintings and murals, the large scale brush handles are made of seasoned hardwood sealed and lacquered with a black, satin matte finish that provides comfort and a non-slip grip. The brushed stainless steel rustproof ferrule is screwed and glued to handle for added durability. The large scale brushes also have holes the handles for easy storage and transport. The 4-brush traditional set includes a round 6, a bright 2, a flat 6 and a filbert 4 brush. The 5-brush large scale set includes a round splatter, a 1" flat, a 1" angle and 1" and 2" paddle brushes.